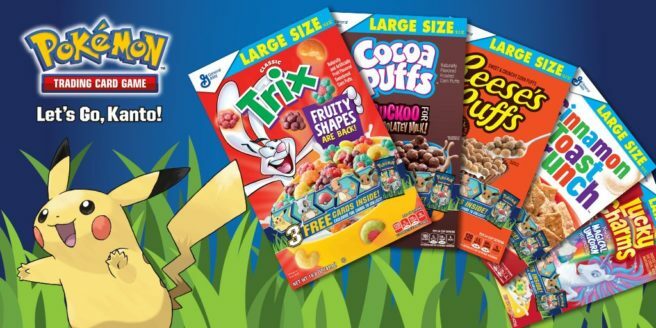 The Pokemon Company has officially announced a new partnership with General Mills that will have sets of Pokemon Trading Card Game cards available in select boxes of Big G Cereals. Up until March 30th, fans can find a pack of three Pokemon TCG cards included within specially marked boxes of Cinnamon Toast Crunch, Lucky Charms, Cocoa Puffs, Trix, and Reese’s Peanut Butter Puffs. Each pack is slated to include two common cards and one of four special foil cards, all featuring Pokemon who first appeared in the Kanto region. The foil cards will highlight either Pikachu, Eevee, Charmander, or Cubone. However, select boxes purchased at Walmart may include Bulbasaur as a fifth foil card option. There are 13 different cards to be included in the promotion total.